Our camp program offers a steady hand to help kids explore. We offer a thoughtful, strategic social growth curriculum combined with a deep love of the outdoors. We are grounded in the understanding that as our campers build their social skills and explore their boundaries with new activities and experiences, they build self-confidence and meaningful relationships. 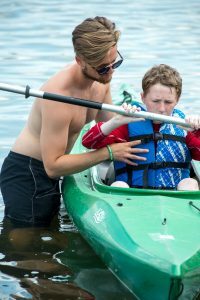 We nurture a supportive environment where our campers build self-acceptance, independence, and connections with other campers and staff. And most of all – where our kids can be themselves and have fun!